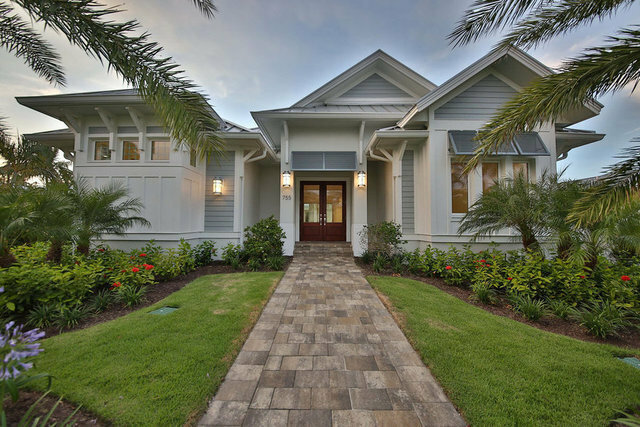 Old Florida style meets Coastal Contemporary in this three-bedroom, four-bath luxury residence six blocks to the beach. Employing a split floor plan on the first floor, the master bedroom en-suite is offset by an office with custom cabinetry. The spacious gourmet kitchen has state-of-the-art Thermador professional appliances and a massive island flows graciously into the family/great room. Pocket sliders open to a peaceful outdoor living area with heated pool, spa and fireplace making this home perfect for entertaining. Two, en-suite bedrooms up are accessed via an elevator which opens a spacious loft. Hand-scraped French oak hardwood floors are among the many architectural appointments and meticulous attention to detail throughout. Designed by Ashmore Design Group and built by Robert D'Angelo Construction. Home is accessed via the alley with a two-garage garage and built-in generator.